To be fair, Voltaggio does credit Mario Batali for the inspiration of his new business model, envisioning a dining destination that he hopes will "also be an amenity for transient diners and downtown residents." The future North Market Kitchen is a 10,000-square-ft. facility that will primarily feature a "rustic-industrial" restaurant with an exhibition kitchen. A specialty foods store, homemade pasta and charcuterie stations, raw bar, cheese counter, and an on-site patisserie and rotisserie are in the works as well. 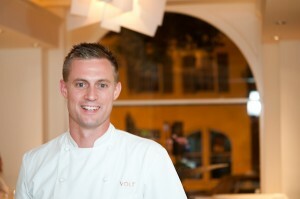 Voltaggio is expecting to hire at least "40-50 cooks to make this happen." It's an ambitious undertaking, especially when Voltaggio has a second restaurant in the works, plus a new cookbook co-written with his brother, Top Chef: Las Vegas champion Michael Voltaggio. Next spring, he plans to open a bistro atop the Chevy Chase Pavilion shopping center where "whole food usage" (i.e. meat on the bone) will set it apart, along with an open kitchen that will make it easier for the chefs to interact with restaurant patrons. The new co-authored cookbook is entitled Volt Ink: Recipes, Stories, Brothers and is based on the experiences behind Bryan's restaurant Volt and Michael's Ink, soon to open in L.A. Expect ingredient-themed recipes as a part of "food families," a concept that both brothers hope to educate their readers about. It's due to publish October 25, 2011. What’s Next For “Top Chef” Winner Michael Voltaggio?